Back to school is here! And those lunches are being packed once again. Along with the sandwiches, fruit, vegetables and snacks, sometimes a cookie is just what it takes to make a lunch box packed ever so sweet. I discovered Nana’s Cookies earlier this year while at a trade show in California and I’ve been hooked ever since. I have always been a fan of Nana’s and have written a couple of blog posts in the past about their amazing Cookie Bars. So, I was more than thrilled to discover that they had a variety of delicious traditional gluten-free cookies too. The flavors are Chocolate, Chocolate Crunch, Ginger, and Lemon. All are delicious and worthy of a special lunchbox treat. 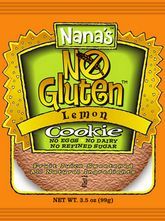 And best yet… all of Nana’s Gluten-Free Cookies are also free of corn, soy, dairy, eggs and casein. All of these delicious reasons are why Nana’s Gluten-Free Cookies are awarded this week’s Friday Favorite on BeFreeForMe.com. Congratulations!